Bryant – The NEC Baseball Rookie of the Year is strutting his stuff in the NECBL. Bryant right-handed starting pitcher Kevin McAvoy is spending the summer as a member of the Keene Swamp Bats’ rotation and recently threw 6.2 innings of no-hit ball. McAvoy’s second start of the summer season ended with the Swamp Bats’ bullpen completing the no-hit bid. The effort landed McAvoy the NECBL Pitcher of the Week award. Read more. 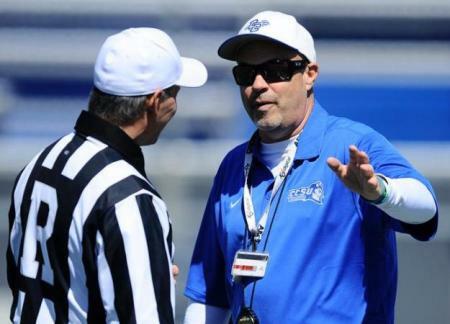 Central Connecticut – It’s no surprise that CCSU head football coach Jeff McInerney is “fired up” for another season on the gridiron. After all, his Twitter handle is “JmFireUp_” for a reason. McInerney and the Blue Devils have released season ticket packages for purchase via the athletic department’s official website. CCSU kicks off the 2012 campaign against defending Big South champion Stony Brook on Sept. 1. Read more. Fairleigh Dickinson – With the season’s start two months away, Stacey Recanati announced the addition of five freshmen for the upcoming campaign. Jordon Collis, Allison Butler, Corey Lostetter, Maddie Gibbons and Grace Hong comprise Recanati’s latest recruiting class and will likely all be in uniform when the Knights open the season against UC Riverside on Aug. 24. Read more. LIU Brooklyn – The borough’s newest head men’s basketball coach made an appearance at Brooklyn’s MCU Park earlier this week. The top assistant coach for the LIU Brooklyn teams that captured the past two NEC Tournament titles, Jack Perri moved over to the head of the bench when Jim Ferry left for Duquesne. On June 25, Perri was introduced to the local community when he threw out the ceremonial first pitch at the Brooklyn Cyclones’ game against Hudson Valley. Read more. Monmouth – Head football coach Kevin Callahan undoubtedly cracked a smile when he caught a glimpse of the Football Championship Subdivision Athletics Directors Association’s (FCS ADA) list of APR honorees. The Hawks received recognition from the FCS ADA for compiling the highest APR score amongst the NEC’s nine football members. The APR Award recognizes one institution at each of the 14 FCS conferences that has the highest APR score. In addition, the Association also recognizes one institution from each conference that has improved the most from the previous year. Read more. Mount St. Mary’s – Ashton Eaton is only days removed from his world record-setting performance in the Decathlon at the US Olympic Trails in Eugene, OR. No, Eaton is not a Mount alumunus, but his coach IS. Harry Marra competed for the Mountaineers’ track and field squad before graduating from the Mount in 1969. Read more. Quinnipiac – The Quinnipiac University Department of Athletics and Recreation placed 57 student-athletes on the Northeast Conference 2012 Spring Academic Honor Roll. Of the 57 student-athletes, 13 were also named to the Commissioner’s Honor Roll with women’s track & field placing a department-best seven student-athletes into that elite category. Read more. Robert Morris – The Colonials combined for the highest collective grade-point average is the Northeast Conference during the 2011-12 academic year. As a result, RMU is the recipient of the Institutional Academic Award. Read more. Sacred Heart – The number of Pioneers playing in collegiate baseball summer leagues swelled to nine earlier this week when Kody Kerski joined the Holyoke Blue Sox of the NECBL. Kerski has been the starting pitcher in each of Sacred Heart’s two NEC Tournament title-clinching contests. Read More. St. Francis (NY) – The countdown has begun. St. Francis Athletics is counting down its Top 20 moments of the 2011-12 academic year in a feature on its official website. The first moment (No. 20) went to the women’s basketball program and head coach John Thurston. Read more. Saint Francis (PA) – Carlin Chesick was a key contributor to the unprecedented run that Red Flash women’s basketball enjoyed in the late 1990s and early 2000s. Competing for the Flash right in the middle of their string of nine NEC Tournament titles over a 10-year span, Chesick was an all-NEC player prior to her graduation in 2003 and is still involved in collegiate athletics today. An assistant commissioner at the NCAA Division II PSAC, Chesick was recently profiled in a special Title IX 40th anniversary series. Read more. Wagner – The Seahawks continue to reach out even further into the community. A partnership was formed between Wagner athletics and Lifestyles For the Disabled earlier this spring, whereby members of the Lifestyles program visit with and interview a Wagner coach, athlete, or group of athletes, for approximately 30 minutes on a bi-weekly basis. Read more. With the 40th anniversary of the legislation’s signing upon us, it is only right to recognize a number of the wonderful women who have made the Northeast Conference, and athletics as a whole, what it is today. From Joan Martin to Susan Hofacre to Brenda Weare, numerous influential women have made unforgettable contributions to the NEC. Two of those women found themselves in the spotlight on this Monday, June 25. 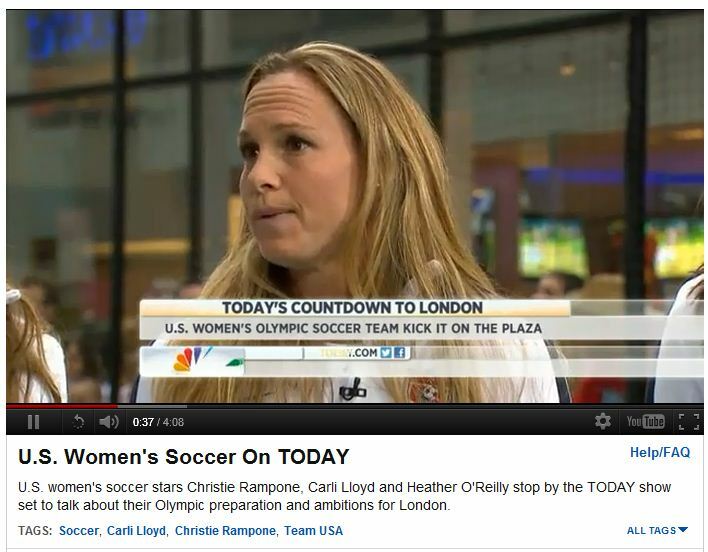 Gearing up for another go-round in the Olympics, NEC Hall of Famer Christie Pearce Rampone (Monmouth) joined a pair of her US Women’s National Soccer Team teammates on NBC’s Today Show. The US captain, and four-time World Cup participant, is living proof that women can be wonderful mothers and world-class athletes at the same time. During the Fall of 2011, NortheastConference.TV had the opportunity to conduct an exclusive interview with Rampone at her alma mater. View that footage below. While Rampone was being featured in Midtown Manhattan, another one of the NEC’s most influential women was telling her story to ESPN Deportes down in Brooklyn Heights. In 2007, longtime St. Francis (NY) Terrier Irma Garica became the first-ever Hispanic woman to attain the position of Athletic Director at the NCAA Division I level. Garcia has spent nearly a quarter-century at the Brooklyn-based institution that has billed itself “The Small College of Big Dreams.” Garcia spent her undergraduate years there as a basketball player and later returned to the take over as the head women’s basketball coach. As part of its Title IX 40th anniversary celebration, the Women’s Sports Foundation honored Garcia in the nation’s capital on June 21. 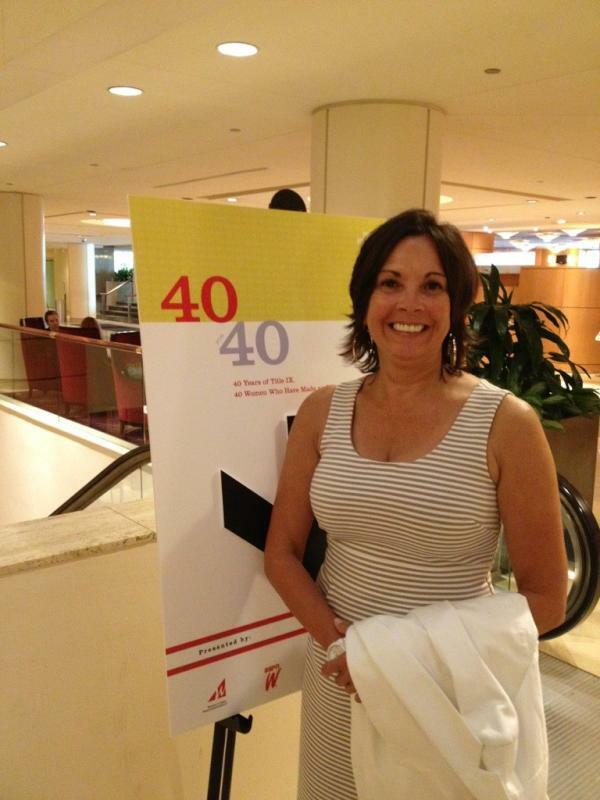 Women’s Sports Foundation ‘40 for 40’ Press Release. @jessmendoza – Happy BIRThDAY Title IX!!!! If it wasn’t for you, millions of girls & women would not b as strong, confident and successful. Thank you!! What Do NEC Student-Athletes Do on Summer Weekends? Summer weekends have historically been a time when people flock to beaches, parks, and ballgames to enjoy some fun in the sun. Whether they compete on the gridiron or the diamond, a number of NEC athletes were engaged by MLB’s Subway Series on Sunday when the Mets sent RA Dickey up against the Yankees’ CC Sabathia. 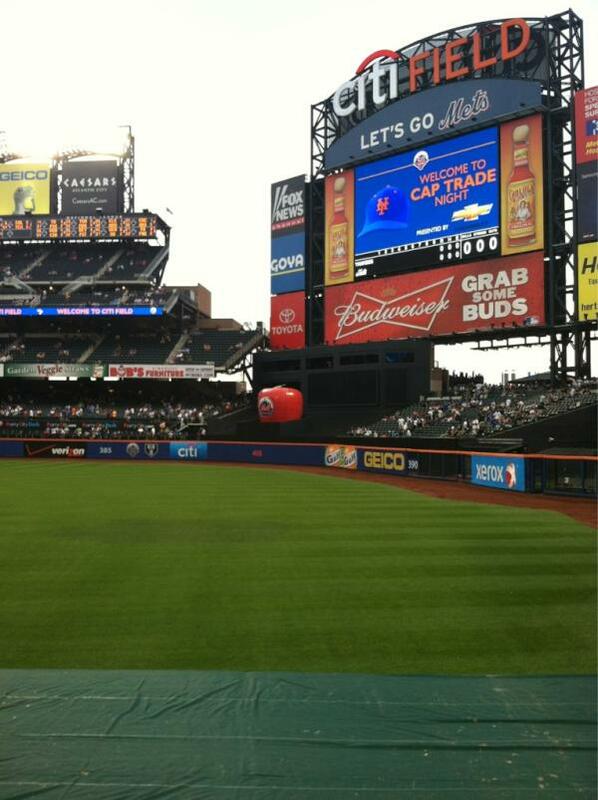 @rmucoop44 – I have to go to a Subway Series game soon. This starting linebacker’s longtime allegiance to the Metropolitans dates back beyond the 2000 World Series. Can someone please help him get a ticket for the 2013 matchup? Meanwhile, This FDU right-handed hurler had no problem finding a ticket to Sunday night’s game. Bryant – Fifteen members of the 2012 NEC baseball regular season champion Bulldogs are scattered in summer leagues throughout the region. Outfielder Kevin Brown, a former NEC Rookie of the Year and NECBL All-Star, along with hurler Craig Schlitter are playing in the famed Cape Cod Baseball League. Meanwhile, 2012 NEC Pitcher of the Year Peter Kelich, who was recently tabbed an ABCA All-Region selection, is spending his summer in the NECBL. Read more. Central Connecticut – Skipper Charlie Hickey has placed 11 Blue Devils in baseball summer leagues and CCSUBlueDevils.com has been tracking their progress. All-NEC outfielder JP Sportman is one of four CCSU players to appear on a NECBL roster. Read more. Fairleigh Dickinson – Both the men’s and women’s golf teams from FDU settled for second-place finishes at the 2012 NEC Golf Championships. There is no doubt the perennial title contenders will look to return atop NEC golf next season, which will begin with a fall tournament at Towson on Sept. 7. Head coach Rob Warren released the Knights’ fall schedule on June 21. Read more. LIU Brooklyn – Mark Calzonetti is coming back to the Northeast Conference. The long-time assistant for Monmouth men’s basketball, who most recently helped Iona to the 2012 NCAA Tournament, is set to join Jack Perri’s staff at LIU. Chuck Bridge also agreed to come aboard as the Blackbirds aim for a third straight NEC Tournament title in 2013. Read more. Monmouth – Khari Bowen found out what it is what like to be a NEC All-Rookie selection on the track this year, and now the Hawk knows how it feels to be a national champion. Bowen won the 5k at the 2012 Jamaican National Junior Championships at Kingston’s National Stadium last weekend. It’s just another honor on a long list for Monmouth Track & Field, which swept the men’s and women’s team titles at the conference’s outdoor championship meet this past May. Read more. Mount St. Mary’s – In addition to welcoming his newborn son into the world (congrats Coach! ), men’s basketball head coach Jamion Christian welcomed Dave Matturro onto his staff as the Director of Basketball Operations. Matturro most recently spent three seasons at MAAC power Siena before making the move to Emmitsburg to join Christian in his first season at the helm. Read more. Quinnipiac – There are still a few months until the TD Bank Sports Center opens its doors for another academic year, but now Bobcats fans know what will be in store for them come the fall. Quinnipiac announced its schedule for all home events at the first-class facility. The men’s hoops team will play five non-conference home games, one of which comes against Patriot League champion Lehigh. Meanwhile, a tussle with Big East member St. John’s highlights the women’s non-league home slate. Read more. Robert Morris – Olivia Netzler is excited about what the upcoming field hockey season may hold for her Colonials. The young women who made for a program-best eight wins last season will be back in 2012 and will play six games in front of their home crowd at Joe Walton Stadium. Netzler officially unveiled the team’s fall schedule on RMUcolonials.com. Read more. Sacred Heart – Following their second consecutive trip to the NCAA Baseball Regionals, numerous SHU players will spend their summer on the diamond. Randy Brochu, the voice of SHU baseball, has vowed to keep tabs on each of these Pioneers while providing periodic updates on the school’s official athletic website. Read more. St. Francis (NY) – Former Terrier hoopster Allan Sheppard has remained connected to his local community. Sheppard had an opportunity to speak at the 2012 Sports Awards Banquet at Randolph Campus High School, his alma-mater, this past spring in Harlem. Sheppard, who is the all-time leading scorer at Randolph with over 3,000 points, was proud to interact with the students and talk about his experiences as a Division I athlete, professional athlete overseas, and his current Team Nike squad. Read more. Saint Francis (PA) – The Red Flash made a huge leap forward, in terms of wins and losses, during their second-ever season on the lanes. Head coach Tom Falbo has already recruited a number a first-class bowlers to Loretto and is looking to continue that trend with Sarah Ross. The western Pennsylvania product, who will enroll at SFU for the fall, has been selected to the prestigious Dexter/USBC High School All-American Team. Read more. 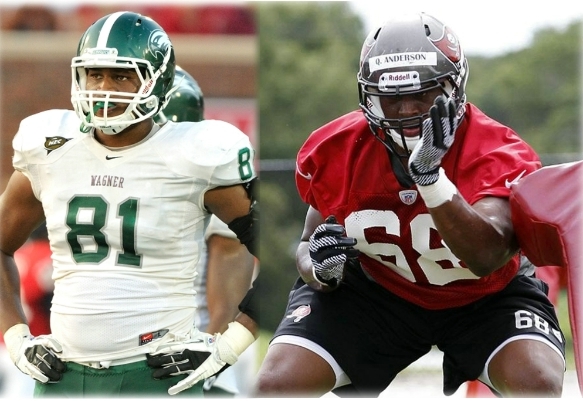 Wagner – Quintin Anderson is one of three Wagner gridders to have signed a NFL free agent contract this offseason. The Seahawks’ former defensive end has the opportunity to prove himself worthy of a spot on the Tampa Bay Bucs’ 53-man roster. WagnerAthletics.com recently caught up with Anderson about postgrad life. Read more. David Letterman has never invited him onto the Late Night Show, but even so, Hall of Fame basketball coach Jim Phelan has made a number of “Top Ten” lists during his life. Other than his current seventh-place standing on the all-time NCAA Division I coaching wins list, Overtime! doesn’t know exactly how many “Top Ten” lists, Phelan has made. Whatever that number may be though, Yahoo! Sports writer Jeff Eisenberg just increased it by one. Being the college hoops junkie that he is, Eisenberg was apparently becoming a bit restless during the offseason. Hence, the creation of “The Untouchables,” a 10-part series that is sure to make fans yearn for the start of another season on the hardwood. One of those 10 records, No. 5 to be exact, belongs to Phelan. Sure, Phelan’s 1962 national championship and 830 overall wins are quite impressive, but it’s the 49-year long tenure that is sure to raise eyebrows. 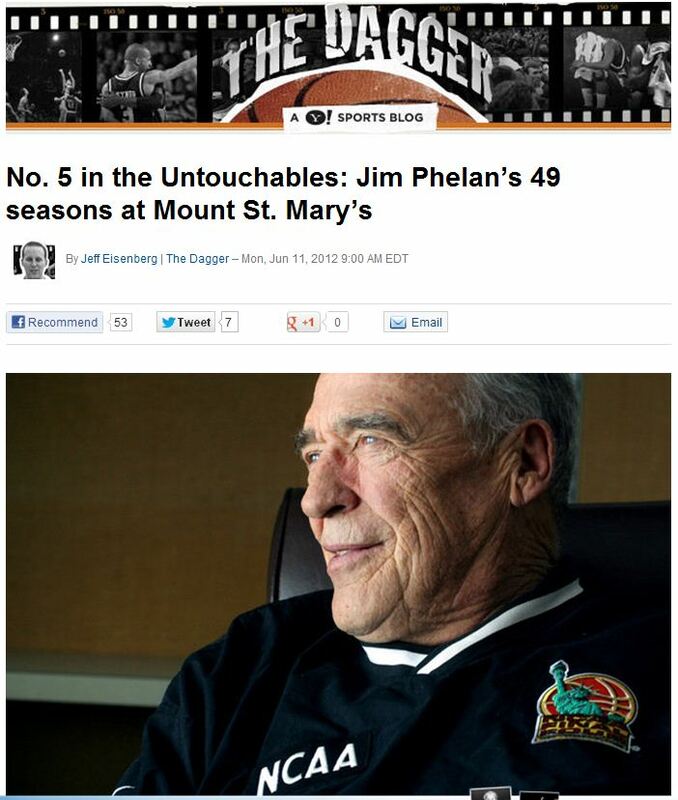 Phelan spent nearly 18,000 days as the head men’s basketball coach at Mount St. Mary’s. To put it in perspective, no current NEC staff member has even been alive for 18,000 days or 49 years! According to Eisenberg, however, there may never be another man quite as lucky. Read Eisenberg’s The Untouchables on Yahoo! @esmitty29 – 2 current players from the little old NEC currently on the 25 man mlb roster. Slowly waiting for @AndrewBailey40 to return to make it 3!